A clear night at 1200 meters, lets the temperature drop dramatically. 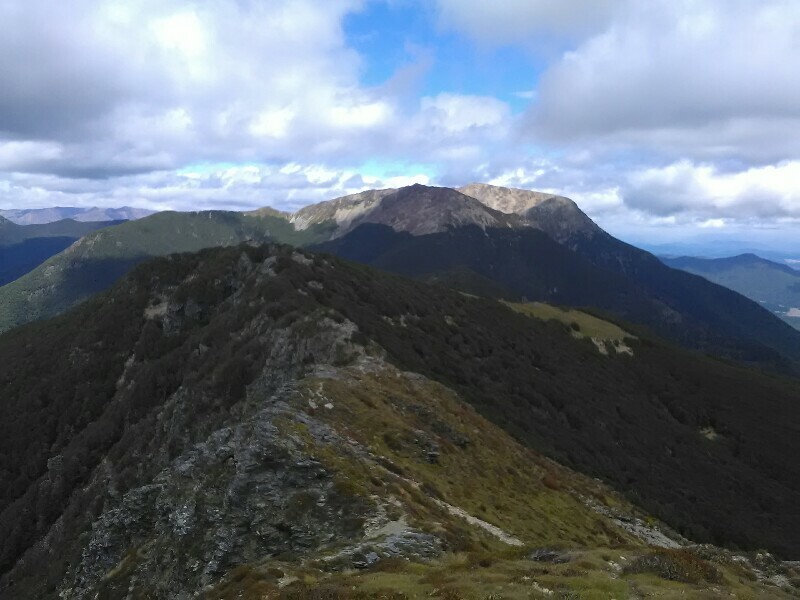 Hiking and scrambling up Mt. Starveall warms me up quickly. Up there I get treated with staggering views and a lovely rocky track following the ridge before dropping down into the bush again. Less than 3 hours after leaving "my" hut, I pass Slaty Hut and climb up Slaty Peak via some lovely scree fields. The bleak landscape reminding me of the Swiss Alps. The closer I get to Old Man Peak, the rougher the track gets. On the slow-going ridge after the peak, I have a decision to make: Do I continue another 5 hours over Mt Rintoul - it's 12:30, so still plenty of time - or do I drop down to and stay at Old Man Hut, located 30 minutes off the track, and do Mt Rintoul tomorrow? Not an easy decision at all! The weather is currently great and if continue, I wouldn't have to do the annoying detour to the hut. As a nice side effect, I'd then also be one day ahead of schedule. But then again, I'm not in a hurry and if I stayed at Old Man Hut, I could do the Richmond Track's most demanding section with "fresh" legs and plenty of time tomorrow morning. 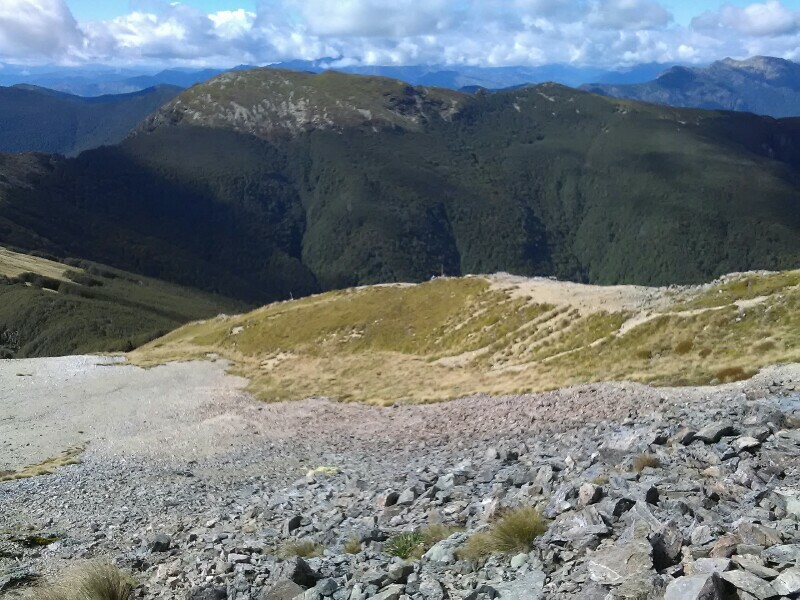 I take a left and descend 200 vertical meters down to Old Man Hut, which is nestled in a wide clearing. It's only 1:30 and there's plenty of time to relax and enjoy the fabulous weather. Speaking of the weather: it's concerning me a little. Even though it's expected to be fine tomorrow, you never really know. 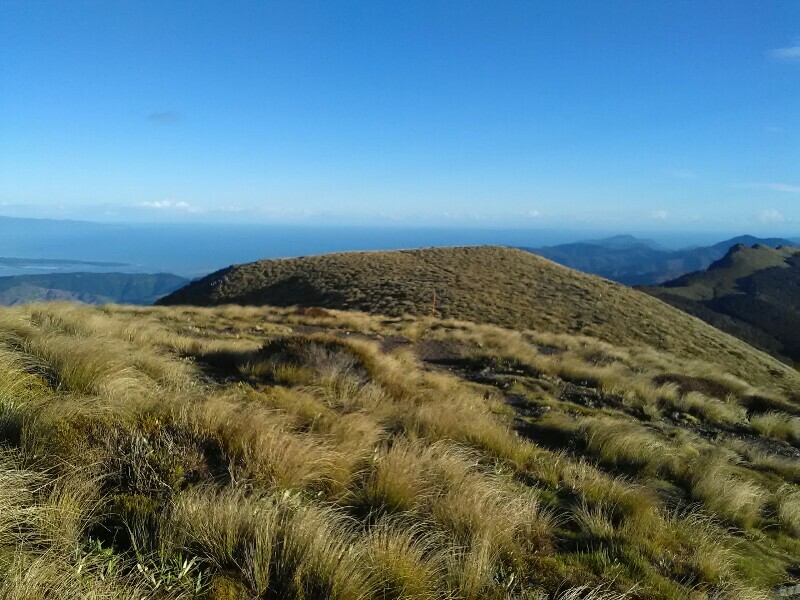 Out of experience, especially strong winds and poor visibility can occur unexpected, making tramping in such exposed terrain unpleasant and dangerous.